Living in Barcelona in the early 1930s, shop girl Natalia meets a determined young man at a fiesta in Diamond Square and Joe – with ‘little monkey eyes’ and ‘little medal-like ears’ – tells her she will become his wife within a year. Written in 1960 and translated into more than 20 languages, this compelling tale of life before, during and after the Spanish Civil War, is narrated by a woman as intense as she is passive. Joe, a carpenter, and Natalia do indeed marry and have a son and daughter. Joe breeds pigeons – ten pairs turn into many more – which live in the loft space and peck away at Natalia, with their appetites, their stench, their comings and goings. When the war erupts, Joe leaves to fight the Fascists and Natalia remains in Barcelona, struggling to feed the children. 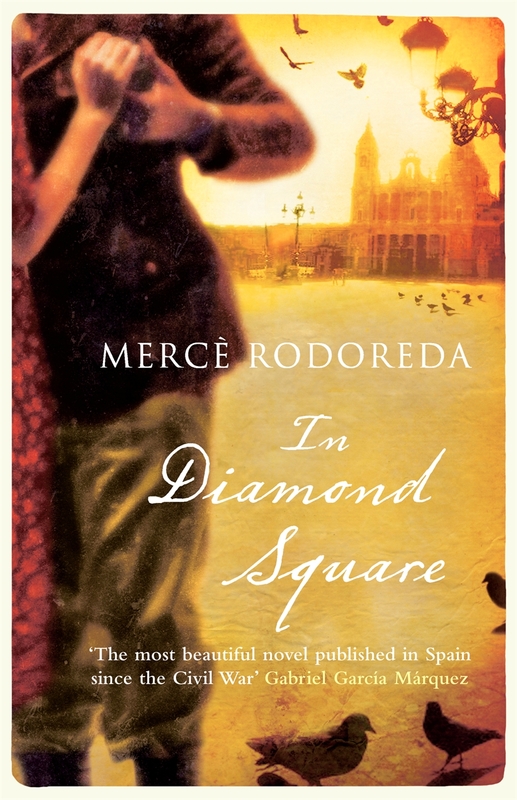 In the prologue to the book’s 1962 publication, Rodoreda wrote that In Diamond Square is ‘a novel about love, as someone has said that it isn’t’ noting the central character has only one thing in common with her – ‘ namely the fact she feels at a loss in the midst of the world’. There is a growing sense of playful menace about motorbike-riding Joe, with his sermons about men and women and their respective rights. He taps his wife sharply on the knee, pinches her under her arm, pours a handful of birdseed down the back of her blouse, and makes her kneel down in the street to beg forgiveness in a row he has manufactured about her going for a walk with her former fiancé, Pete. ‘My mother had never told me about men,’ says Natalia, whose parents’ marriage was summed up by ‘Sunday afternoons sitting in the dining room not saying a word to each other’. Rodoreda denied feminist intent but it’s easy to interpret the novel – and its symbolism of a set of scales etched onto the stairs to the couple’s flat with ‘one of the scales set slightly below the other’ – as a study of a woman’s lot, as much as a comment on the unequal human existence (not least in a war setting, with the hunger, poverty and shaven heads of children, the city’s lights painted blue, and the death of fighters). The kaleidoscope of evocative images is constant – Joe’s tricky mother with her house of ribbons and a ‘cream eiderdown patterned with red roses and a frilly red border’ and Father John’s watery black clothes ‘as if he was made from the wings of a fly’. There are smells of grain and potatoes and spirit of salts in the grocer’s, the boom…boom sound from a conch shell, the flutter of white paper roses at a wedding and a guest wearing earrings with lilac-coloured gems. Wonderfully vivid and intense, In Diamond Square has a pervasive sense of hope and yearning with an emotional jolt around every corner as well as the occasional flash of humour – Natalia and Joe’s marriage party is gate-crashed by half-a-dozen men in their forties celebrating a successful appendicitis operation endured by the fellow dancing with a deaf-aid hanging from his ear. Gabriel Garcia Marquez has called In Diamond Square ‘the most beautiful novel published in Spain since the Civil War’ and this translation from Catalan by Peter Bush deftly captures the rich intricacy of Rodoreda’s lingering prose, the mix of want and sadness, and the tenacity of the human spirit.